Q. How can I rid my PC of annoying background noises? I've recently added some new gear to my PC-based studio and now get low-level whistling noises through my loudspeakers that weren't there before. Is this gear faulty, or could the problem lie in the computer or cables? SOS contributor Martin Walker replies: At some stage in every musician's career, 'ground loops' raise their ugly heads, and I suspect they've just done so to you. They can occur as soon as you have two or more items of mains-powered gear that are themselves grounded for safety reasons (via the earth wire of their three-pin mains plugs). Then, when you connect the two together with a screened audio cable, which completes the loop, currents flow through the multiple paths, and background noises can get amplified by your audio gear. In analogue-only days, the noises were simply low-level background hums at mains frequency and its lower harmonics (either 50, 100 and 150 Hz or 60, 120 and 180 Hz, depending where in the world you live). However, with the onset of computer technology we suddenly had a whole new raft of ground-loop nasties consisting of any or all of the following: high-pitched whistles, whines, regular ticks, hisses or streams of scratching/ticking noises that coincide with computer mouse movements or graphics card or hard-drive activity. Sadly, the human ear is far more sensitive to these sounds than it is to a tiny bit of hum, so digital gear can result in a lot more frustration. Common scenarios nowadays include a grounded computer with internal soundcard that's connected to active monitor speakers (this is the reason why running a laptop on battery power invariably cures ground loop noises — by disconnecting it from the mains you break the loop), and a grounded computer connected to an external audio interface that is itself grounded via its own mains power supply. The loop possibilities multiply alarmingly once you add a synth or two, and especially if you throw multi-output audio interfaces and mixing desks into the equation: ground-loop noises may appear suddenly, and seemingly without rhyme or reason. 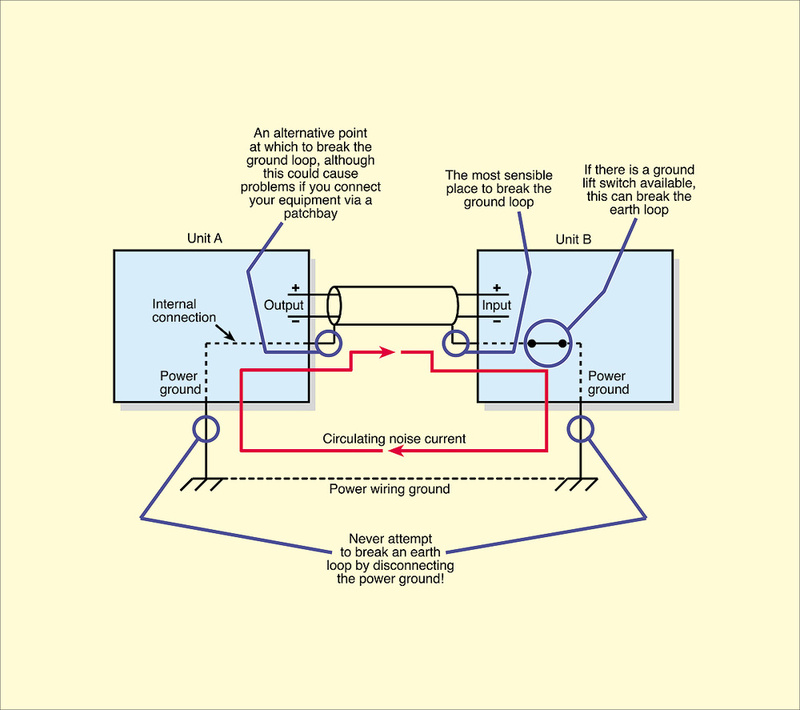 Suggested points at which you can break a problematic ground loop.To eradicate such ground loops for good, you must first physically unplug every analogue and digital audio cable from the computer, and then check that its audio output is totally interference free, using headphones plugged into a suitable audio output, or perhaps via a battery-powered external headphone amp. Next, reattach each audio cable one by one, checking at each stage to make sure that there's still no interference. As soon as you hear any, the cable you've just plugged in is the cause (or at least a cause; there may be more than one). If you find an offending analogue audio cable, there are three ways to break the ground loop. The first is to make sure you only use balanced audio outputs connected to balanced audio inputs via balanced TRS or XLR cables. This is arguably the cheapest and best approach if your gear has suitable I/O, since it cures most ground-loop problems at a stroke. 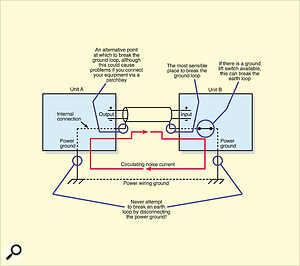 Occasionally you may also need to cut the cable screen at the destination (input) end of your cable just before it reaches pin 1 of the XLR plug (see diagram). If the offending cable connects an unbalanced output to a balanced input, you can replace it with a pseudo-stereo cable (either a DIY version if you're handy at soldering, or a ready-made one from the SOS Shop /shop/Product.php?ProdID=424). The ultimate solution is to buy a line-level DI box that uses audio transformers to 'galvanically isolate' the input from the output. Two of the most popular stereo models are the ART DTI Dual Transformer and Ground Loop Isolator (/sos/feb12/articles/art-dti.htm) and Orchid Electronics Dual Channel Isolator (www.orchid-electronics.co.uk/dual_isolator.htm). If the offending cable is a digital one, a similar approach can be used. AES/EBU cables with XLR connectors invariably cure the problem if you have such I/O available, and the hopefully rare problems due to coaxial S/PDIF cables can be bypassed by switching to S/PDIF optical cables, should this alternative be catered for by your gear. Sadly, some digital cables may result in ground loops that are not as easy to solve. For instance, if you connect your grounded computer to a stand-alone USB/Firewire audio interface that is already grounded, depending on the interface design, connecting the USB/Firewire cable may complete a ground loop — there's little you can do about it, since breaking the ground connection in these cables will probably result in the device not being recognised by your computer (I wrote more on this in SOS August 2008 /sos/dec08/articles/qa1208_2.htm and SOS February 2009 /sos/feb09/articles/qa0209_2.htm). In such cases you may still be able to reduce the audible effects significantly by reducing the physical size of the loop.Use the shortest USB/Firewire cable you can get away with, and make sure the two mains cables of your devices are plugged into the mains supply as closely together as possible. USB 'isolators' are available (for instance www.olimex.com/Products/USB-Modules/USB-ISO), but unfortunately these rarely support speeds above 12Mbps, and are therefore unsuitable for most USB 2 audio interfaces. The most sensible way to connect all your studio gear to the mains supply is at a single wall socket pair, via multiple mains distribution boards, rather than spread the mains cables among sockets around the room. This will minimise the effects of any ground loops that are difficult to remove. Finally, never be tempted to snip the 'safety earth' connection inside the mains plugs of any of your gear; they're designed to keep you safe in the event of a fault condition, and if you remove them you could be electrocuted. Stay safe!